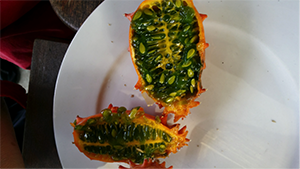 Kiwano African Horned Cucumber was the star today. 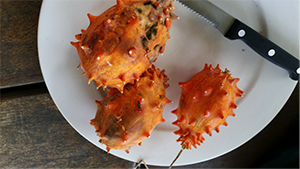 This spiky cucumber was orange as it was now ready for harvesting and also the insides were jelly like. You eat it earlier on when the insides are firmer. Peel off the skin and cut into slices. We scooped out the pulp. This needs to ferment a day or two then the seeds are dried. As usual we enjoyed a multicultural feast for morning tea. Afterwards we harvested seeds- a whopping 33 varieties today. Many thanks to all the people who patiently sacrificed a plant and saved seeds for everyone else to enjoy next season. 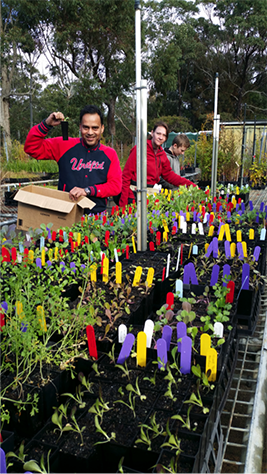 The seeds were cleaned from the plants and packaged up to sell at the meetings as well as a selection of seedlings.